It's been a bit of a frantic week, between a freelance graphic design gig and trying to desperately make the deadline for the Australian Model Expo which is on in just under two weeks. But I managed to find time to produce a video showing my trick for painting worn black leather boots, shoes and belts. It's a simple and bombproof tip - it gives a great, realistic result every time. The beauty of this technique is that if you're lazy it gives a solidly realistic result straight off the bat. 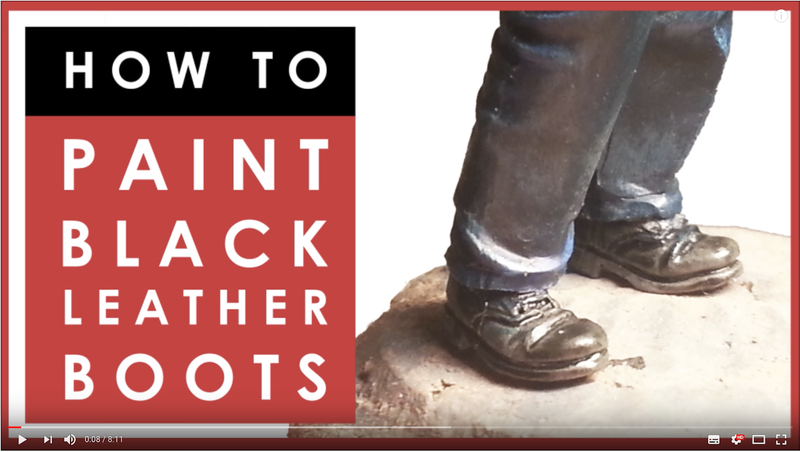 But if you want to detail it further, to give a better impression of worn, scuffed, dirty boots, then this technique lays the groundwork for all of that. Give it a try - it works. There is a great line in the film Anchorman where one of the characters says, "60% of the time it works every time". Well with this technique, 100% of the time it works every time. How to easily paint black leather boots on scale model figures.